Yes…I take picture of all my quilts in the exact same spot with the exact same pillow (from Target). Sophie has the best bed with the best light and this quilt matches Sophie’s Ice Cream sheets perfectly (also from Target)! Anyways…this is Celebrate! My favorite quilt of the new bunch. This quilt is so happy. I went for “party” colors and I love these colors mix together. The red stripe binding makes it just that much more fun. Melissa quilted this one, and it’s backed in the teal Dixie cherry print. This quilt has found a home on Sophie’s bed, but it would be equally cute in blues and greens (or any colors) for a boy. The pattern uses fat quarters and includes 5 size options…I made the throw size for the cover. You can see more about Celebrate here in my shop. Have a great day (and it’s already Thursday…yay)! 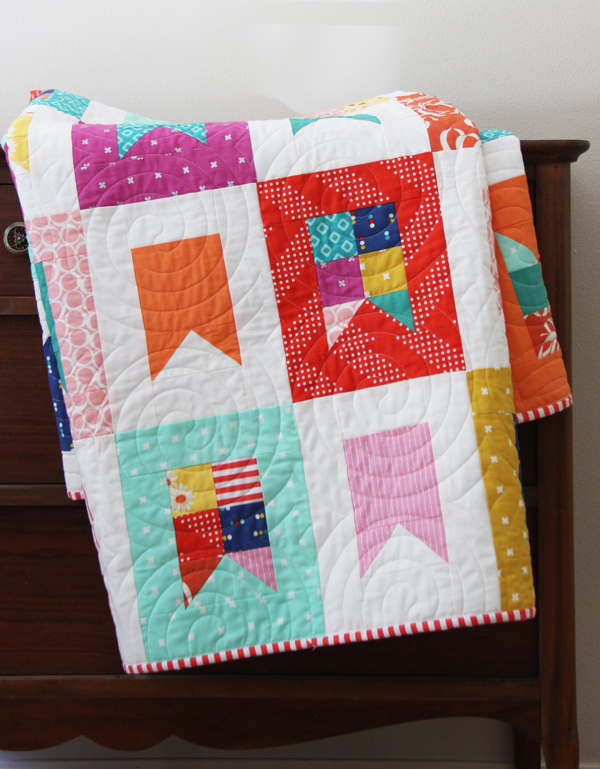 I love the fabrics and the quilt. It would be a great pattern for a boating person with nautical flags. May need to do one of these soon. I love it!:! so happy! I love this quilt!! Great job! Love this festive pattern. I would love to make this with a nautical spin. 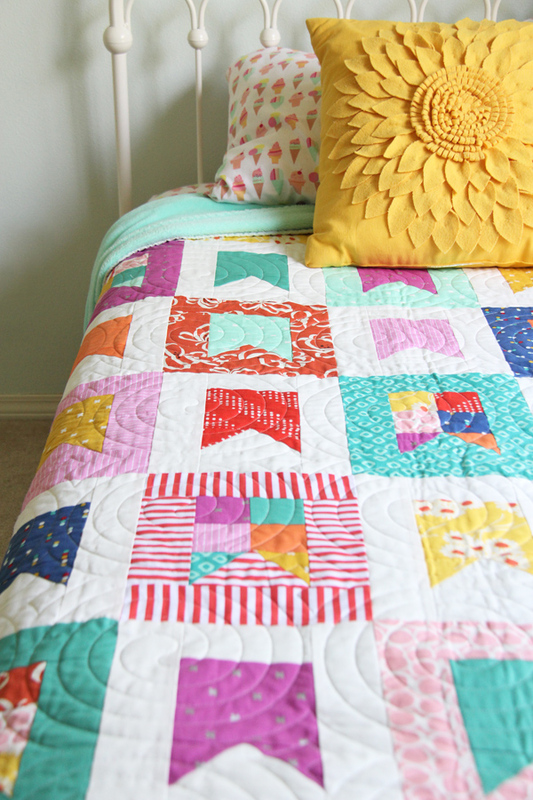 Super cute quilt. I love it! 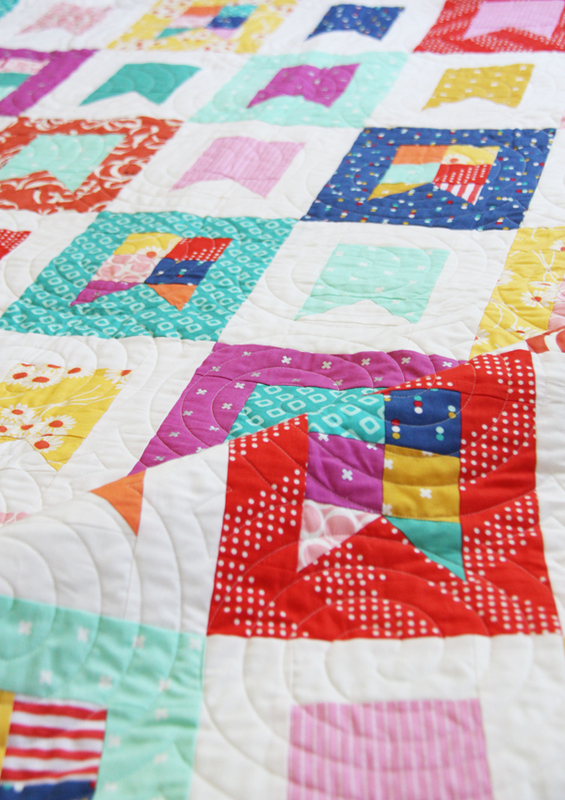 Such a gorgeous quilt – and yes, once you find the best light, you can’t NOT take the photos there! Such a fun pattern, and congrats on your fabric line (I really love that grass green). Hmm, or is it more jade green? On IG it looked more grassy – I guess I need to see it up close in person! You are right it’s more grassy! :) Thank you! Oh I am celebrating!!! I saw this and see so many possibilities!! Thank you!! I just bought the pattern and, since I work at a quilt shop, will be picking up a bunch of fat quarters today. :) Oh yeah!! What a great design and color combo! Love that target pillow too! Love this pattern! And I always love your photographs!! Thanks for all you do for us! I LOVE this one! Perfect for celebrating….anything! 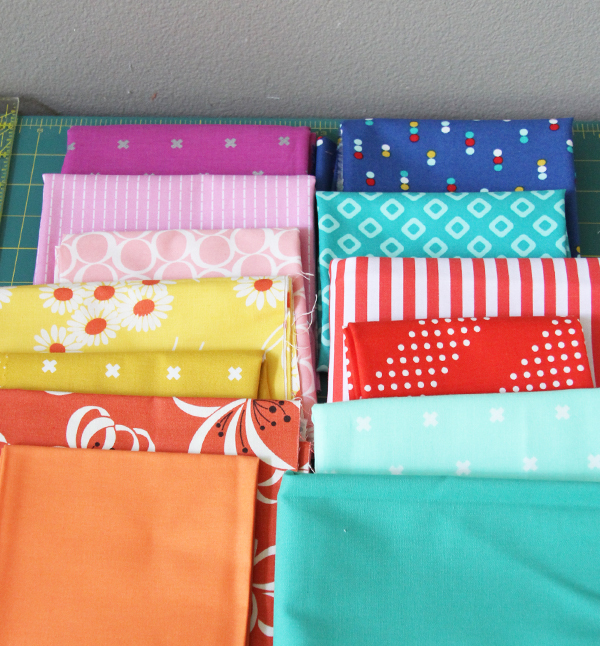 And there’s nothing like stripe binding….my favorite! 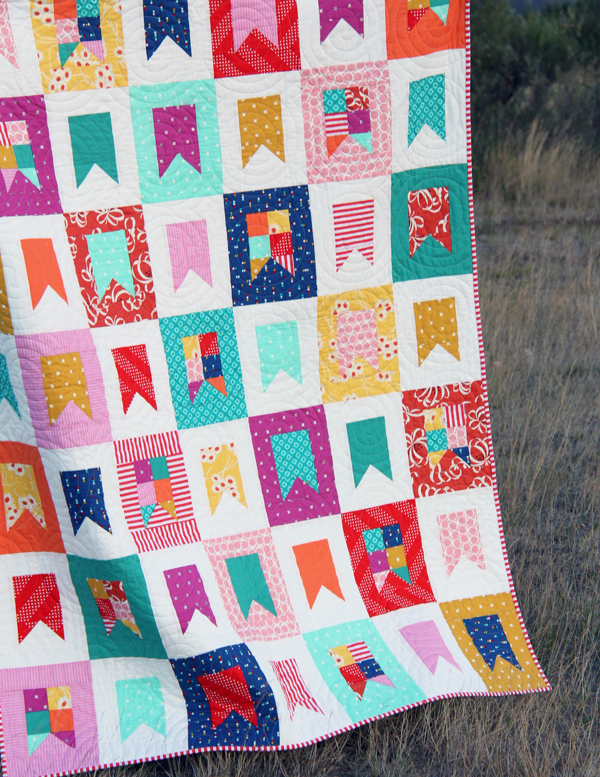 This quilt makes me want to celebrate, too! Love this pattern and it could be done in so many different color ways (or ‘festive’ ways….hmm autumn, winter, valentine’s. My mind is filled with possibilities!). Love this one! I can’t stop seeing those as King Arthur pennants. Gotta make one up before my boys get too old! !!! Lovelovelove this! And it’s funny – before I scrolled down to the text, I thought, “Ooh!! She has the ice cream sheets from Target!” I’ve been trying to justify them for my daughters’ beds, but we have a plethora of bedding as it is lol. I love this quilt! Wouldn’t it be fun for a kid’s room with matching flags to hang? 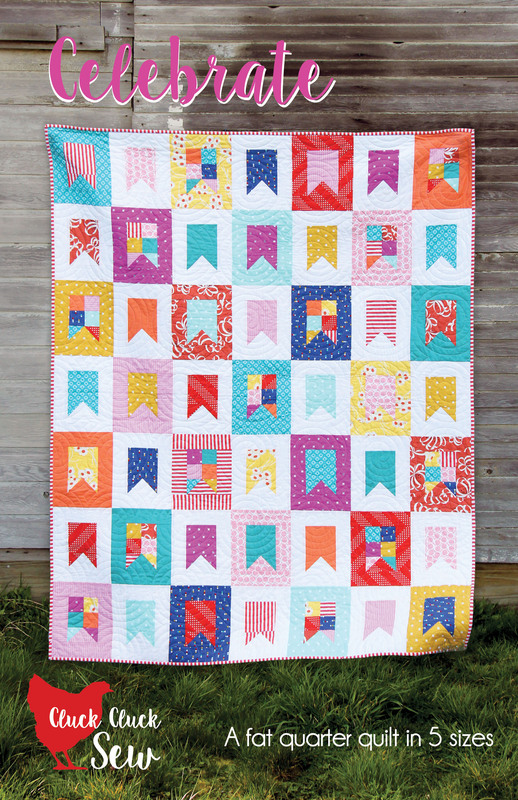 Such a cute and happy quilt. 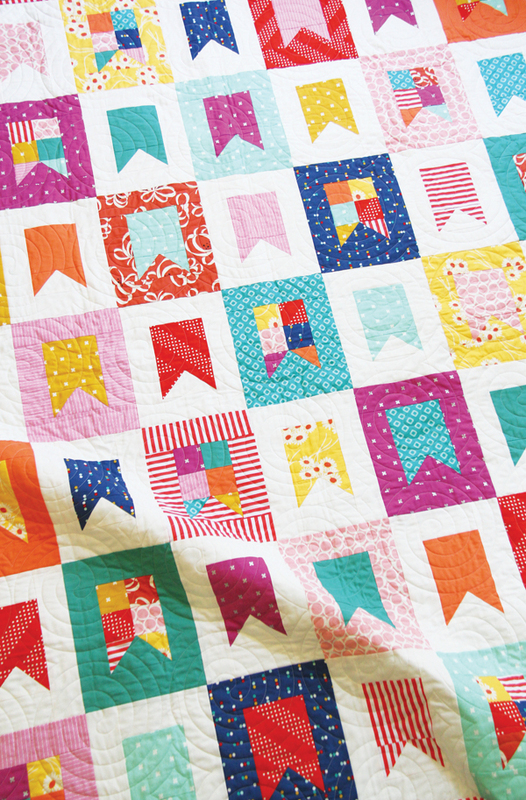 I ADORE this quilt,but isn’t it basically the same as the “Celebrate” quilt pattern by Sweetwater? What a delightful quilt! You’re a very WISE mom to keep your kids out of giant driftwood shelters. Those and giant trees washed ashore (here on the WA coast) move and roll and have claimed lives. Hello! I just purchased this pattern and absolutely love the fabrics you used! 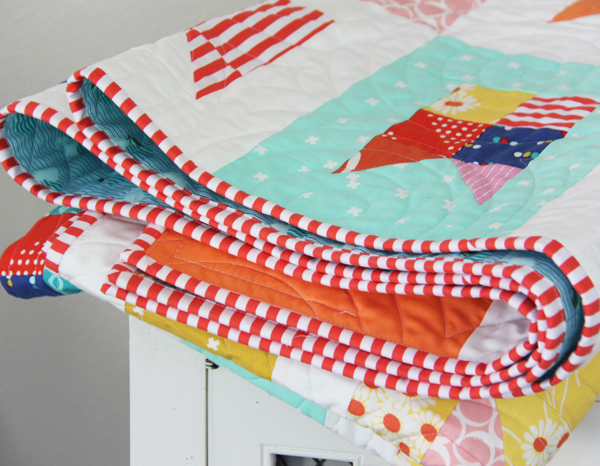 Are they part of a collection or did you just select fabrics you liked for this quilt?! I would love any information on the fabric if you are interested in sharing what you used! Hi Tiffany! I just selected them randomly, and since it was so long ago most of them might be unavailable. If I were you I would just aim to copy the colors, since most of my prints were basics it shouldn’t be too hard to track down some cute basics in the same colors!